his is a fun summer design! Sew this onto a beach towel, tote, or home decor for the season! 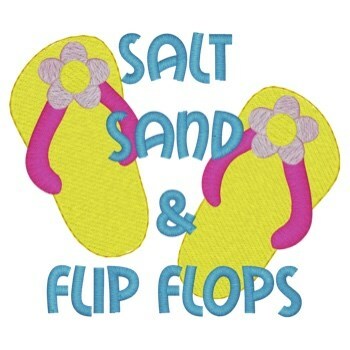 Dakota Collectibles is happy to present Salt, Sand, & Flip Flops machine embroidery design which has 11521 stitches and is [74.68 mm x 86.61 mm] large. If you would like to view more embroidery patterns please search on our embroidery designs page.